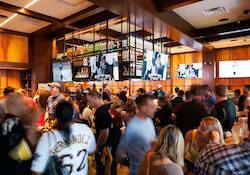 Bracket Room is an upscale sports bar and restaurant in the heart of Arlington. The bar's custom-made bar stools and 35 infinity edge televisions make it the perfect place to watch the game during the day. At night, a DJ and live entertainment turn it into a nightlife destination.